A melancholic air hangs over the tumbleweed town of Kandos, population 1,284, in regional New South Wales. “For Sale” signs haunt the gardens of dozens of fibro and weatherboard houses. Many shops on the town’s main strip are closed. This empty, unrepaired air is apparent before you even arrive: you learn that coach services run only once a day since the trainline was decommissioned in 2007; you make numerous unreturned calls to the proprietors of the few motels and pubs. This is the unlikely site of Cementa Contemporary Arts Festival, established in the long shadow of the cement plant that closed in 2012. So embedded was the industry in the town’s history that its name was originally Candos—an acronym based on the names of the founding members of the Board of NSW Cement, Lime and Coal Co Ltd, which christened the town in 1914. The largest industry is now the public school system. How do you build a biennial art event in a dying town? What can art offer a place like Kandos? And what exactly is the relationship between Cementa and the town and townspeople? These questions recurred, almost intrusively, in my mind and in conversations over four days in Kandos exploring a program of over 60 artists working in sound, performance, installation, photography and sculpture in 20 different venues ranging from a garage at the CWA to the Kandos Museum. For me, the festival was most energised and effective when it related directly to the general population of Kandos. A Galaxy of Suns was one of two choral-based performances that directly engaged Kandos’ seniors and their interest in singing. It tracked the rising and setting of stars, with Kandos at the centre of the universe. Real-time data was translated into musical notes and piped via a smartphone app into the ears of townspeople who sang individual tones while arranged around the perimeter of the community hall. Draped in silver Eyes Wide Shut-like capes, the singers were intensely focused and evidently proud of their performance. 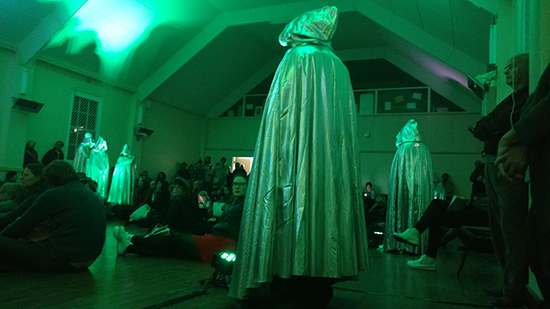 The audience, seated on the floor in the middle of the space, listened for 40 minutes and watched as neon ‘Northern Lights’ cast the singers’ shadows against the high, barn-like ceiling—a relaxing and embracing experience, conjured by visual artist Michaela Gleave, composer Amanda Cole and new media artist and programmer Warren Armstrong. This turned out to be one part of a successful stream of the festival program: collaborative works that connected the tiny town with grander celestial or ecological themes, giving Kandos its own place in the cosmos. Like Lynette Wallworth’s recent video installation, Coral, at Carriageworks, Scott Towney’s Wiradjuri Murriyang (Wiradjuri Sky World), was a video projected inside a large dome. I lay on the floorboards of the community hall and watched 24 hours of sunrise to sunset compressed into three minutes. 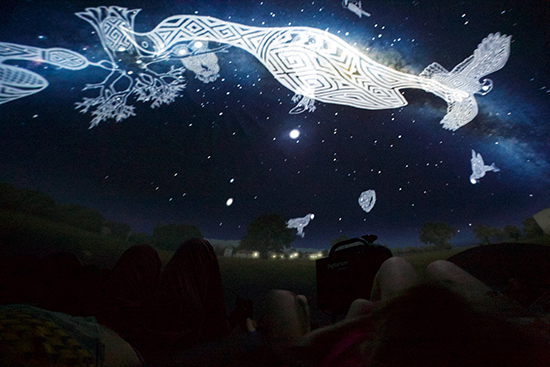 Over the stars, Towney had drawn his own versions of Wiradjuri constellations in white linear forms: Baiame (the creator), an eagle, a serpent. The piece really captured the way the Earth moves in a way you rarely think about or see represented visually. There is a problem: although the video of the stars is based on the Kandos night sky, the landscape at the work’s perimeter is a generic one, an image of the French countryside derived from the automatic inputs of the program Stellarium in which the work was rendered. But in concept, Towney’s work reminded me that everything in Australia has a secret Indigenous history and the stars are no exception. Like every society, Aboriginal nations had astronomical systems; theirs mapped the constellations and the negative spaces between them, weaving that material knowledge into each nation’s stories, morals, laws and navigational systems. “Those systems have not been destroyed,” said Towney’s work. Wiradjuri Murriyang is an instruction to art audiences that Indigenous notions of ecology are not just about the land; they extend through the air to space, encompassing globe and universe, and in that sense are well-suited to a spherical frame rather than a rectangular one. 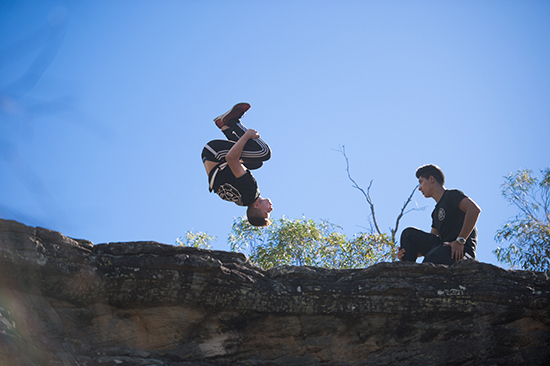 Presented by Fairfield’s Powerhouse Youth Theatre, Pagoda Parkour was successfully sited in Ganguddy, in Wollemi National Park, 30 minutes from Kandos. The area is gorgeous, with a river and large mystical boulders scattered around. The six performers of Dauntless Movement Crew were skilled and charismatic; the choreography (by Victoria Hunt) moved from strong tableaux of the performers high in the ancient landscape and accelerated in pace and dynamism to the point where the crew were running and jumping off three-metre cliff-faces and somersaulting over big piles of dirt. I turned from the performance to the audience to see mainly locals and their children, gazing with pure rapture. I guessed the kids had never before thought of art in these terms. Not only did PYT make the work over five days at Ganguddy, but they conducted parkour workshops at the local high school over the course of a month—a great example of the festival implanting itself in meaningful ways in the community and landscape of the area. The larger works, backed by the brains of organisations and teams of artists, often provided the most engaging and well-contextualised moments of the festival. Artists cannot be part of the Cementa program unless they have been in residence at lead curator Ann Finnegan’s Kandos Projects or made work that relates to the region, but that wasn’t always apparent from the placement and development of individual artists’ works. Two pieces by solo artists left lasting impressions. 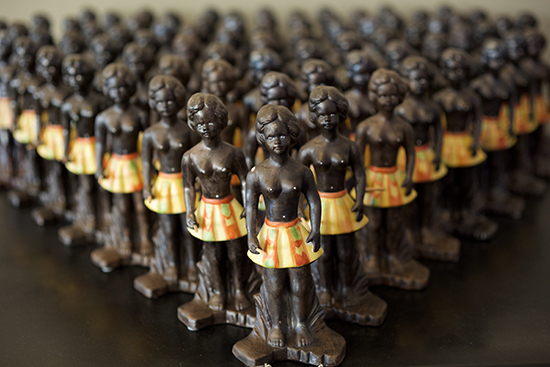 Conceptual artist Tony Albert is preoccupied with the ways that 20th century artists have represented Aboriginal people in cliched, racist and naive ways. For Cementa, he collected objects within that tradition—vintage service trays, golliwog-like figurines—and transformed them into absurd contemporary works by installing them as sculptures in geometric compositions in the Honeytree Cafe. The colonialist legacy that Albert ironises is ever-present in Kandos: a sign at the perimeter of the town declares its foundation in 1914, with no mention of the Wiradjuri nation that predated it by 60,000 years. The charity store on Angus Avenue stocks any number of $2 prints of paintings in a bland European style that render the bush unrecognisable. Albert’s work plugged an important gap in the festival program, by critiquing overtly racist elements of Australian art history. Paul Greedy’s Untitled (Wire No.5) epitomised what site-responsive work is all about. 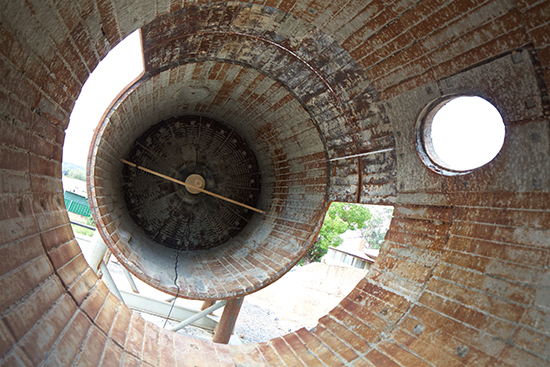 Inside disused cement mill equipment—a giant horizontal cylinder with gaps so that you could walk straight into it—Greedy installed a single piano wire. Bounced by the wind, it played a single note, and also picked up radio transmissions from time to time. Installed in an off-street location outside Kandos Museum, its purpose was to deliver a site-specific work not for a gallery-going audience but for the public. It was complete. How else might the attention of artists transform Kandos? Cementa’s Land+Art residency is an attempt to go beyond the festival’s four-day duration and create a broader impact; it’s not strictly a contemporary art project, but this year artist Gilbert Grace tried to obtain a licence for local sequence-farmer Stuart Andrews to grow a crop of low-THC industrial hemp to aid the production of a bamboo-hemp bicycle as a form of low-cost transport for the area. With the leadership of incoming artistic director Bec Dean, alongside Alex Wisser and Christine McMillan, whose efforts have fuelled Cementa through its first three iterations, this cross-section of art thinking and ecological-cultural impact is an interesting one; I’m curious to see how the residency develops and if it can achieve resonant outcomes. Cementa sets itself high goals. After all, a festival is not just about the art, but everything around it: the experience, the environmental and community contexts, the stop-and-chats on the street, the sense of belonging and purpose that we are all going somewhere together, constructing some kind of future that has space for us. Read about Cementa17 participating artists here.